Varnish is an open-source HTTP accelerator. More concretely it is a web application that acts like a HTTP reverse-proxy. You place Varnish in front of your application servers (those that are serving HTTP content) and it will cache that content for you. If you want more information on what Varnish cache can do for you, then I recommend reading through their introduction article (and watching the video linked there as well). Fastly is many things, but for most people they are a CDN provider who utilise a highly customised version of Varnish. This post is about Varnish and explaining a couple of specific features (such as hit-for-pass and serving stale) and how they work in relation to Fastly’s implementation of Varnish. One stumbling block for Varnish is the fact that it only accelerates HTTP, not HTTPS. In order to handle HTTPS you would need a TLS/SSL termination process sitting in front of Varnish to convert HTTPS to HTTP. Alternatively you could use a termination process (such as nginx) behind Varnish to fetch the content from your origins over HTTPS and to return it as HTTP for Varnish to then process and cache. Note: Fastly helps both with the HTTPS problem, and also with scaling Varnish in general. recv: request is received and can be inspected/modified. hash: generate a hash key from host/path and lookup key in cache. hit: hash key was found in the cache. miss: hash key was not found in the cache. pass: content should be fetched from origin, regardless of if it exists in cache or not, and response will not be cached. pipe: content should be fetched from origin, and no other VCL will be executed. fetch: content has been fetched, we can now inspect/modify it before delivering it to the user. deliver: content has been cached (or not, if we had used return(pass)) and ready to be delivered to the user. For each state there is a corresponding subroutine that is executed. It has the form vcl_<state>, and so there is a vcl_recv, vcl_hash, vcl_hit etc. So in vcl_recv to change state to “pass” you would execute return(pass). If you were in vcl_fetch and wanted to move to vcl_deliver, then you would execute return(deliver). Note: vcl_hash is the only exception because it’s not a state per se, so you don’t execute return(hash) but return(lookup) as this helps distinguish that we’re performing an action and not a state change (i.e. we’re going to lookup in the cache). The reason for this post is because when dealing with Varnish and VCL it gets very confusing having to jump between official documentation for VCL and Fastly’s specific implementation of it. Even more so because the version of Varnish Fastly are using is now quite old and yet they’ve also implemented some features from more recent Varnish versions. Meaning you end up getting in a muddle about what should and should not be the expected behaviour (especially around the general request flow cycle). Fastly has a couple of excellent articles on utilising the Vary HTTP header (highly recommended reading). When using the open-source version of Varnish, you’ll typically implement your own custom VCL logic (e.g. add code to vcl_recv or any of the other common VCL subroutines). But it’s important to be aware that if you don’t return an action (e.g. return(pass), or trigger any of the other available Varnish ‘states’), then Varnish will continue to execute its own built-in VCL logic (i.e. its built-in logic is appended to your custom VCL). Note: after v3 Varnish renamed the file from default.vcl to builtin.vcl. But things are slightly different with Fastly’s Varnish implementation (which is based off Varnish open-source version 2.1.5). On top of the built-in VCL the open-source version of Varnish uses, Fastly also includes its own ‘custom’ VCL logic alongside your own additions. You can see Fastly’s VCL boilerplate, and learn more about their custom VCL implementation here. There are various request flow diagrams for Varnish (example) and generally they separate the request flow into two sections: request and backend. So handling the request, looking up the hash key in the cache, getting a hit or miss, or opening a pipe to the origin are all considered part of the “request” section. Whereas fetching of the content is considered part of the “backend” section. The purpose of the distinction is because Varnish likes to handle backend fetches asynchronously. This means Varnish can serve stale data while a new version of the cached object is being fetched. This means less request queuing when the backend is slow. But the issue with these diagrams is that they’re not all the same. Changes between Varnish versions and also the difference in Fastly’s implementation make identifying the right request flow tricky. 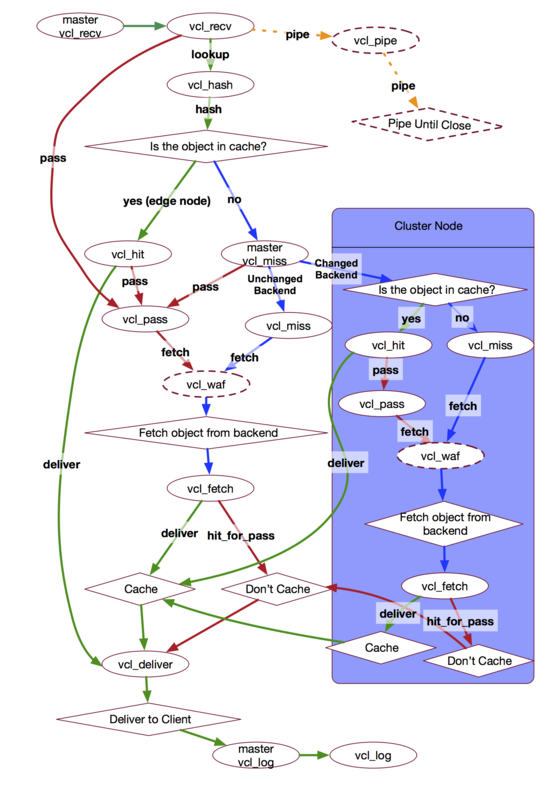 Below is a diagram of Fastly’s VCL request flow (including its WAF and Clustering logic). This is a great reference for confirming how your VCL logic is expected to behave. Each Varnish ‘state’ has a set of built-in variables you can use. Based on Varnish 3.0 (which is the only explicit documentation I could find on this), although you can see in various request flow diagrams for different Varnish versions the variables listed next to each state. But this was the first explicit list I found. It’s important to realise that the above matrix is based on Varnish and not Fastly’s version of Varnish. But there’s only one difference between them, which is the response object resp isn’t available within vcl_error when using Fastly. When you’re dealing with vcl_recv you pretty much only ever interact with the req object. You generally will want to manipulate the incoming request before doing anything else. Note: the only other reason for setting data on the req object is when you want to keep track of things (because, as we can see from the above table matrix, the req object is available to R/W from all available states). Once a lookup in the cache is complete (i.e. vcl_hash) we’ll end up in either vcl_miss or vcl_hit. If you end up in vcl_hit, then generally you’ll look at and work with the obj object (this obj is what is pulled from the cache - so you’ll check properties such as obj.cacheable for dealing with things like ‘hit-for-pass’). If you were to end up at vcl_miss instead, then you’ll probably want to manipulate the bereq object and not the req object because manipulating the req object doesn’t affect the request that will shortly be made to the origin. If you decide at this last moment you want to send an additional header to the origin, then you would set that header on the bereq and that would mean the request to origin would include that header. Note: this is where understanding the various state variables can be useful, as you might want to modify the req object for the sake of ‘persisting’ a change to another state, where as bereq modification will only live for the lifetime of the vcl_miss subroutine. Once a request is made, the content is copied into the beresp variable and made available within the vcl_fetch state. You would likely want to modify this object in order to change its ttl or cache headers because this is the last chance you have to do that before the content is stored in the cache. Finally, the beresp object is copied into resp and that is what’s made available within the vcl_deliver state. This is the last chance you have for manipulating the response that the client will receive. Changes you make to this object doesn’t affect what was stored in the cache (because that time, vcl_fetch, has already passed). Now that we know there are state variables available, and we understand generally when and why we would use them, let’s now consider the problem of clustering (in the realm of Fastly’s Varnish implementation) and how that plays an important part in understanding these behaviours. Because, if you don’t understand Fastly’s design you’ll end up in a situation where data you’re setting on these variables are being lost and you won’t know why. So let me give you a real example: creating a HTTP header X-VCL-Route breadcrumb trail of the various states a request moves through (this is good for debugging, when you want to be sure your VCL logic is taking you down the correct path and through the expected state changes). In this diagram we can see the various states available to Varnish, but also we can see that the states are separated by an “edge” and “cluster” section. Note: this graph is a little misleading in that vcl_error should appear in both the “edge” sections, as well as the “cluster” section. We’ll come back to this later on and explain why that is. Now the directional lines drawn on the diagram represent the request flow you might see in a typical Varnish implementation (definitely in my case at any rate). Let’s consider one of the example routes given: we can see a request comes into vcl_recv and from there it could trigger a return(pass) and so it would result in the request skipping the cache and going straight to vcl_pass, where it will then fetch the content from origin and subsequently end up in vcl_fetch. From there the content fetched from origin is stored in the cache and the cached content delivered to the client via vcl_deliver. That’s one example route that could be taken. As you can see there are many more shown on the diagram, and many more I’ve not included. But what’s important to understand is that Fastly’s infrastructure means that vcl_recv, vcl_hash and vcl_deliver are all executed on an edge node (the node nearest the client). Whereas the other states are executed on a “cluster” node (or cache node). † not documented, but Fastly support suggested it would execute at the edge. Data added to the req object cannot persist across boundaries (except for when initially moving from the edge to the cluster). Data added to the req object can persist a restart, but not when they are added from the cluster environment. For number 1. that means: req data you set in vcl_recv and vcl_hash will be available in states like vcl_pass and vcl_miss. For number 2. that means: if you were in vcl_deliver and you set a value on req and then triggered a restart, the value would be available in vcl_recv. Yet, if you were in vcl_miss for example and you set req.http.X-Foo and let’s say in vcl_fetch you look at the response from the origin and see the origin sent you back a 5xx status, you might decide you want to restart the request and try again. But if you were expecting X-Foo to be set on the req object when the code in vcl_recv was re-executed, you’d be wrong. That’s because the header was set on the req object while it was in a state that is executed on a cluster node; and so the req data set there doesn’t persist a restart. Let’s now revisit our requirement, which was to create a breadcrumb trail using a HTTP header (this is where all this context becomes important). Note: we check req.restarts to make sure we don’t include a leading , unnecessarily. So we know from the “State Variables” section earlier, that the req object is available for reading and writing. You can see we’re not setting the value anew on the header, but am appending to the header. The idea of appending to the header, again makes things tricky (as we’ll see) when we come to trying to persist data across not only the cluster but the caching of an object as well. So we still set a value on the req object, but we don’t append to X-VCL-Route, we instead create a new header X-PreFetch-Miss. The eagle eyed amongst you may notice we took the value we assigned to the new header from bereq. I do this for semantic reasons rather than any real need. When we move to vcl_miss the req object is copied to bereq. So to make the distinction that req (once outside of vcl_recv) is only useful for tracking information, I use bereq as the value source. But I could have just used req.http.host and req.url as the value assigned to the header. We take the X-VCL-Route and we assign it to a header of the same name, but on the beresp object. We take the X-PreFetch-Pass and X-PreFetch-Miss headers and also assign those to the beresp object. Finally we create a new header X-PostFetch and give it a fresh value that indicates we’re in the fetch state. Firstly, when we move from vcl_pass or vcl_miss to vcl_fetch the content we fetched from origin is assigned to the object beresp. When we leave vcl_fetch the object beresp will be stored in the cache. So any header we set on that object will exist when we pull the object from the cache at a later time (e.g. when we lookup content in the cache and we move to vcl_hit that subroutine will have access to an obj object, which is the beresp object pulled from the cache). Also when we leave vcl_fetch and move to vcl_deliver, the beresp object is copied into a new object (available in vcl_deliver) called resp. You’ll find when vcl_hit moves to vcl_deliver the obj object which was pulled from the cache is also copied over to resp in vcl_deliver. Now the reason why we set data onto beresp in vcl_fetch is because we’re ultimately about to cross the boundary of a cluster node (vcl_fetch) to an edge node (vcl_deliver) and so if we were to continue setting data onto req (like we did in vcl_pass and vcl_miss), then that data would be lost by the time we changed state from vcl_fetch to vcl_deliver. The reason we set separate headers for the vcl_pass, vcl_miss and vcl_fetch states is because we wanted to ensure the beresp object stored in the cache had a clean request history at the point in time when it was cached. Otherwise we would have issues later on when pulling the object from the cache and trying to append values in vcl_deliver (we could end up with large chunks of the breadcrumb trail duplicated). So for this reason, we separate the baseline routing (i.e. vcl_recv and vcl_hash) from all the other states (e.g. vcl_pass, vcl_miss, vcl_fetch) and then when we arrive at vcl_deliver we grab the baseline X-VCL-Route header and append to it the values from X-PreFetch-Pass, X-PreFetch-Miss and X-PostFetch only once we identify (via other inputs - which we’ll see shortly) the actual route taken. So we start by checking if there is a X-VCL-Route header available on the incoming object, and if so we overwrite the existing req.http.X-VCL-Route header with that resp object’s value. This is important because we could have arrived at vcl_deliver from the edge node (or never even left the edge node) depending on specific scenarios such as going from vcl_recv straight to vcl_error. This point about vcl_error is very important, we’ll skip that discussion for moment and come back to it. Next in vcl_deliver, once we have reset the X-VCL-Route header on the req object, we look at fastly_info.state which is Fastly’s own internal system for tracking the current state of Varnish. We first look to see if we’ve had a ‘hit-for-pass’ (see the next section for details on that), and if so we append the relevant information to the header. Next we check we had a hit from an earlier cache lookup, again, if we have then we append the relevant information. If you want more information on fastly_info.state see this community comment. After that we check if the X-PreFetch-Pass, X-PreFetch-Miss or X-PostFetch headers exist, and if so we append the relevant details to the X-VCL-Route header. Finally leaving us with appending the current state (i.e. we’re in vcl_deliver) to the header. The vcl_error subroutine is a tricky one because it exists in both the edge and the cluster environments. Meaning if you execute error 401 from vcl_recv, then vcl_error will execute in the context of the edge node; whereas if you executed an error from a cluster environment like vcl_fetch, then vcl_error would execute in the context of the cluster node. Meaning, how you transition information between vcl_error and vcl_deliver could depend on whether you’re on a edge or cluster node. To help explain this I’m going to give another real example, where I wanted to lookup some content in our cache and if it didn’t exist I wanted to restart the request and use a different origin server to serve the content. To do this I expected the route to go from vcl_recv, to vcl_hash and the lookup to fail so we would end up in vcl_miss. Now from vcl_miss I could have triggered a restart, but anything I set on the req object at that point (such as any breadcrumb data appended to X-VCL-Route) would have been lost as we transitioned from the cluster back to the edge (where vcl_recv is). † which would include vcl_recv, vcl_hash and vcl_miss. Remember the req object does persist across the edge/cluster boundaries, but only when going from vcl_recv. After that, anything set on req is lost when crossing boundaries. Now we could have arrived at vcl_error from vcl_recv (e.g. if in our vcl_recv we had logic for checking Basic Authentication and none was found on the incoming request we could decide from vcl_recv to execute error 401) or we could have arrived at vcl_error from vcl_miss (as per our earlier example). So we need to check the internal Fastly state to identify this, hence checking fastly_info.state ~ "^MISS". After that we append to the obj object’s X-VCL-Route header our current state (i.e. so we know we came into vcl_error). Finally we look at the status on the obj object and see it’s a 901 custom status code and so so we append that information so we know what happened. But you’ll notice we don’t restart the request from vcl_error, because if we did come from vcl_miss the data in obj would be lost because ultimately it was set in a cluster environment (as vcl_error would be running in a cluster environment when coming from vcl_miss). Instead we return(deliver), because all that data assigned to obj is guaranteed to be copied into resp for us to reference when transitioning to vcl_deliver at the edge. Once we’re at vcl_deliver we continue to set breadcrumb tracking onto req.http.X-VCL-Route as we know that will persist a restart from the edge. Now typically when you return(pass) you do that in vcl_recv to indicate to Varnish you do not want to lookup the content in the cache and to skip ahead to fetching the content from the origin. But when you return(pass) from vcl_fetch it causes a slightly different behaviour. Effectively we’re telling Varnish we don’t want to cache the content we’ve received from the origin. In the case of the VCL logic above, we’re not caching this content because we can see there is a cookie set (indicating possibly unique user content). This content isn’t cached simply because the backend has indicated (via the Cache-Control header) that the content is private and so should not be cached. But you’ll find that even though you’ve executed a return(pass) operation, Varnish will still create an object and cache it. The object it creates is called a “hit-for-pass” (if you look back at the Fastly request flow diagram above you’ll see it referenced) and it is given a ttl of 120s (i.e. it’ll be cached for 120 seconds). Note: the ttl can be changed using vcl but it should be kept small. Varnish implements a type known as a ‘duration’ and takes many forms: ms (milliseconds), s (seconds), m (minutes), h (hours), d (days), w (weeks), y (years). For example, beresp.ttl = 1h. The reason Varnish creates an object and caches it is because if it didn’t, when return(pass) is executed and the content subsequently is not cached, then if another request is made for that same resource, we would find “request collapsing” causes a performance issue for users. Request collapsing is where Varnish blocks requests for what looks to be the same uncached resource. It does this in order to prevent overloading your origin. So for example, if there are ten requests for an uncached resource, it’ll allow one request through to origin and block the other nine until the origin has responded and the content has been cached. The nine requests would then get the content from the cache. As you can imagine, this is very bad because the requests for this uncachable content has resulted in sequential processing. So when we “pass” inside of vcl_fetch Varnish prevents this bad sequential processing. It does this by creating a “hit-for-pass” object which has a short ttl of 120s, and so for the next 120s any requests for this same resource will not result in request collapsing (i.e. user requests to origin will not be blocked waiting for an already “in-flight” origin request to complete). Meaning, all requests will be sent straight through to the origin. What this does is it checks whether the object we found in the cache has the attribute cacheable set to ‘false’, and if it does we’ll not deliver that cached object to the user but instead skip ahead to fetching the resource again from origin. By default this cacheable attribute is set to ‘true’, but when Varnish executes return(pass) from inside of vcl_fetch it caches the “hit-for-pass” object with the cacheable attribute set to ‘false’. The reason the ttl for a “hit-for-pass” object is supposed to be short is because, for that period of time, your origin is susceptible to multiple requests. So you don’t want your origin to become overloaded by lots of traffic for uncacheable content. See this Varnish blog post for the full details. If we get a 5xx error from our origins we don’t cache them. But instead of serving that 5xx to the user (or even a custom 500 error page), we’ll attempt to locate a ‘stale’ version of the content and serve that to the user instead (i.e. ‘stale’ in this case means a resource that was requested and cached previously, but the object was marked as being something that could be served stale if its ‘stale ttl’ has yet to expire). The reason we do this is because serving old (i.e. stale) content is better than serving an error. In order to serve stale we need to add some conditional checks into our VCL logic. Where <object> is either beresp (vcl_fetch) or resp (vcl_deliver). Where <N> is the amount of time in seconds you want to keep the object for after its ttl has expired. stale_while_revalidate: when cache ttl expires, we’ll serve stale for N seconds while we acquire fresh content. stale_if_error: if we have an error, we’ll serve stale for N seconds while we acquire fresh content. Even more specifically, stale_while_revalidate causes Varnish to serve stale after a cache MISS, while it asynchronously fetches a newer version of the content from origin. This takes precedence over stale_if_error. The use of beresp.stale_if_error is effectively the same as Varnish’s beresp.grace. But be careful if your VCL already utilises Varnish’s original grace feature, because it will override any Fastly behaviour that is using the stale_if_error. You can find more details on Fastly’s implementation here as well as a blog post announcing this feature here. If you want details on Varnish 4.0’s implementation of serving stale, see this post. You might find that you’re not serving stale even though you would expect to be. This can be caused by a lack of shielding (an additional Fastly feature that’s designed to improve your hit ratio) as you can only serve a stale cached object if the request ended up being routed through the POP that has the content cached (which is more difficult without shielding enabled). Another reason would be to use “soft purging” rather than hard purges. Lastly, there’s one quirk of Fastly’s caching implementation you might need to know about: if you specify a max-age of less than 61 minutes, then your content will only be persisted into memory (and there are many situations where a cached object in memory can be removed). To make sure the object is persisted (i.e. cached) on disk and thus available for a longer period of time for serving stale, you must set a max-age above 61 minutes. So if we find a stale object, we need to deliver it to the user. But the action you take (as far as Fastly’s implementation of Varnish is concerned) depends on which state Varnish currently is in (vcl_fetch or vcl_deliver). When you’re in vcl_fetch you’ll return(deliver_stale) and in vcl_deliver you’ll return(restart). The reason for this difference is to do with Fastly’s Varnish implementation and how they handle ‘clustering’. According to Fastly you’ll typically find, due to the way their ‘clustering’ works, that vcl_fetch and vcl_deliver generally run on different servers (although that’s not always the case, as we’ll soon see) and so different servers will have different caches. If a stale object is found in vcl_fetch, then deliver_stale will send the found stale content to vcl_deliver with a status of 200. This means when vcl_deliver checks the status code it’ll not see a 5xx and so it’ll just deliver that stale content to the user. Imagine vcl_fetch is running on server A and vcl_deliver is running on server B (due to Fastly’s ‘clustering’ infrastructure) and you looked for a stale object in vcl_fetch. The stale object might not exist there and so you would end up passing whatever the origin’s 5xx response was onto vcl_deliver running on server B. Now in vcl_deliver we check stale.exists and it might tell us that an object was found, remember: this is a different server with a different cache. In this scenario we have a 5xx object that we’re about to deliver to the client, but on this particular server (B) we’ve since discovered there is actually a stale object we can serve to the user instead. So how do we now give the user this stale object and not the 5xx content that came from origin? In order to do that, we need to restart the request cycle. When we return(restart) in vcl_deliver it forces Fastly’s version of Varnish to break its clustering behaviour and to now route the request completely through whatever server vcl_deliver is currently running on (in this example it’ll ensure the entire request flow will go through server B - which we know has a stale object available). This means we end up processing the request again, but this time when we make a request to origin and get a 5xx back, we will (in vcl_fetch) end up finding the stale object (remember: our earlier restart has forced clustering behaviour to be broken so we’re routing through the same server B). Now we find stale.exists has matched in vcl_fetch we will return(deliver_stale) (which we failed to do previously due to the stale object not existing on server A) and this means the stale content with a status of 200 is passed to vcl_deliver and that will subsequently deliver the stale object to the client. In this scenario we don’t find a stale object in either vcl_fetch or vcl_deliver and so we end up serving the 5xx content that we got from origin to the client. Although you may want to attempt to restart the request and use a custom header (e.g. set req.http.X-Serve-500-Page = "true") in order to indicate to vcl_recv that you want to short-circuit the request cycle and serve a custom error page instead. With Fastly, to set-up logging you’ll need to use their UI, as this means they can configure the relevant integration with your log aggregation provider. But what people don’t realise is that by default Fastly will generate a subroutine called vcl_log. The vcl_log subroutine executes after vcl_deliver. So it’s the very last routine to be executed before Varnish completes the request (so this is even after it has delivered the response to the client). The reason this subroutine exists is because logging inside of vcl_deliver (which is how Fastly used to work - i.e. they would auto-generate the log call inside of vcl_deliver) they wouldn’t have certain response variables available, such as determining how long it took to send the first byte of the response to the client. So what I was confusedly thinking was: “why is Fastly generating a single log call in vcl_log, is there a technical reason for that or a limitation with Varnish?” and it ended up simply just being that some Fastly users don’t want to write their own VCL (or don’t know anything about writing code) and so they are quite happy with knowing that the UI will trigger a single log call at the end of each request cycle. Where (as a programmer) I was expecting to add log calls all over the place! But I never realised a vcl_log was being auto-generated for me by Fastly. Meaning… I never realised that an extra log call (after all the log calls I was manually adding to my custom VCL) was being executed. So when I eventually stumbled across a Fastly documentation page talking about “duplicate logs”, I started digging deeper into why that might be …and that’s where I discovered vcl_log was a thing. As you can probably tell, this recommended condition will never match and so the log call isn’t executed. So there we have it, a quick run down of how some important aspects of Varnish and VCL work (and specifically for Fastly’s implementation). One thing I want to mention is that I am personally a HUGE fan of Fastly and the tools they provide. They are an amazing company and their software has helped BuzzFeed (and many other large organisations) to scale massively with ease. I would also highly recommend watching this talk by Rogier Mulhuijzen (Senior Varnish Engineer - who currently works for Fastly) on “Advanced VCL”: vimeo.com/226067901. It goes into great detail about some complex aspects of VCL and Varnish and really does a great job of elucidating them. Lastly, there was a recent article from an engineer working at the Financial Times, detailing the complete request flow from DNS to Delivery. It’s very interesting and covers a lot of information about Fastly. Highly recommended reading.